Sebring, Fla., Mar. 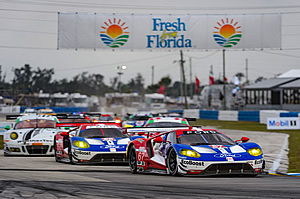 19, 2016 – The road to Le Mans continued Saturday at Sebring International Raceway, and although the Ford Chip Ganassi Racing team came up just short in a quest for a podium spot at the 12 Hours of Sebring, there were still plenty of bright spots to point to when the checkered flag fell. Once again, both the No. 66 and No. 67 finished the race on track. But this time the No. 67 Ford GT (Richard Westbrook/Ryan Briscoe/Scott Dixon) battled all day on the lead lap, led a portion of the race, and was in contention for a podium finish in the final 10 minutes of the race before getting knocked off track. The car finished fifth in GTLM. The No. 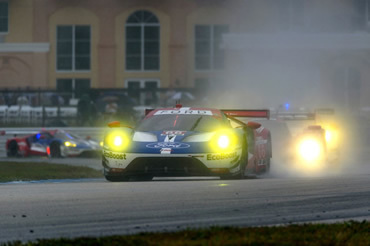 66 Ford GT (Joey Hand/Dirk Müller/Sébastien Bourdais) ran strong early, but hydroplaned off the track during a massive rainstorm, causing major front-end damage that needed to be repaired in the paddock. A heroic effort by Ford Chip Ganassi Racing got the car repaired in just over 15 minutes and it returned just six laps down. It finished eighth in class. * -- Last driver in car. NOTE: The No. 67 Ford GT led laps for the first time with Scott Dixon behind the wheel.